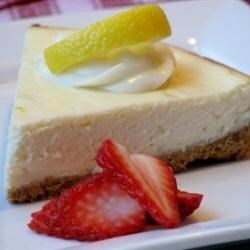 "This cheesecake is creamier than most cheesecakes, and very easy to make. Use grated lemon zest or 1 teaspoon lemon extract for flavoring." Beat softened cream cheese slightly. Add eggs, sugar, vanilla, and lemon zest. Beat until light and fluffy. Pour mixture into crust. Bake at 350 degrees F (175 degrees C) until firm, about 25 minutes. Let cheesecake cool then top with cherry or blueberry pie filling, if desired. Refrigerate for at least 8 hours before serving. Simple,basic recipe...comes out a little too flat,if you want a higher cheesecake you have to double the recipe. I made a homemade graham craker crust and added some small choc. chip morsels. My husband loved it and he knows cheesecakes. It came out extremely creamy and silky. I was very proud of the first ever cheesecake I made.